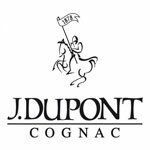 J. Dupont Cognac was founded in 1872 by one Julien Dupont (hence the 'J' in the title). He didn't begin marketing his wares until the year 1878, and the house was purchased in 1992 by Michel Boinaud, a close family friend. The Boinaud family have been winegrowers in the Cognac regions since at least 1640, and they bring their masterful expertise to the brand, but still in keeping with the classic influence of the Art Deco era that J. Dupont Cognac flourished throughout. Coming under the umbrella of the largest family vineyard in the region (420 hectares of prime Grande Champagne), the house is in the happy situation of having Cognacs stored in their cellars that date back over a century, right through to some of the best vintages of more recent years. J. Dupont Cognac was, and still is, influenced by the Bell Epoque Golden Years of the late 19th and early 20th century, and their Cognacs truly reflect this. Using a combination of traditional and contemporary, the house produces a small range of artistic Cognacs, one that symbolizes both the historical and the modern take on eaux-de-vie. 2015 - Double gold, San franciso World Spirits Competition.